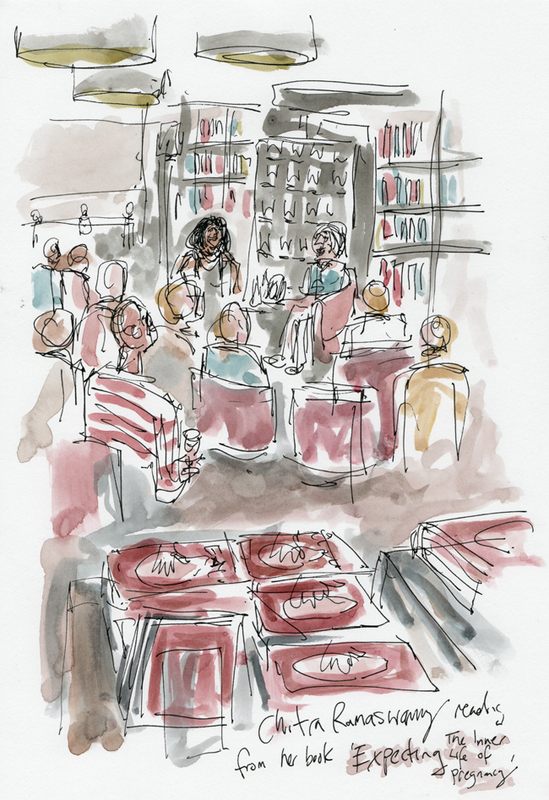 Last night an old friend launched their debut book and I was there to capture the night in watercolour. ‘Expecting: The Inner Life of Pregnancy’ is Chitra Ramaswamy’s first book and goes on sale online and on the high street today. Through a series of nine essays, one for each month of her pregnancy the author shows a fascinating and honest glimpse of being pregnant. Thanks to Waterstones West End for the photos below. The illustration was drawn on location on A4 cartridge heavy weight paper, in black fineliner 0.5 and with a watercolour wash.